Congratulations to the 2018 Adelaide ‘Everybody Dance NAO’ Winners! Last weekend our popular robot dancing contest was hosted in partnership with the superb Adelaide City Library. We had four enthusiastic schools with ten teams between them. The participating schools were: Parafields R-7 School, St Michaels Lutheran Primary School, St John’s Grammar School, and Woodcroft College. Each team demonstrated excellent skills in teamwork, problem solving, and programming. The goal was for the students - with the help of their dedicated teachers - to programme a NAO robot to dance for up to 30 seconds using the Choregraphe software. However, the extra challenge was none of the students had ever worked with a physical robot before! All the teams completed their preparatory coding work on the Virtual Robot in Chorégraphe. Then, at the Dance Off Hackathon, they were able to get hands on with a real NAO robot to test out their programming. It was fantastic to see all the teams take up the challenge and have fun, while adjusting any last-minute coding to create their innovative dance moves. Everyone made a brilliant effort, especially our winners … Woodcroft College! Our Everybody Dance NAO Champions from Woodcroft College created a NAO dance that incorporated music, flashing LEDs (that changed colour) and speech, alongside great, balanced dance moves! Each of the Dance moves were judged on their Balance, Creativity, Fluidity of Movement and Musical Timing, with a bonus point for original musical composition. We were fortunate to have three exceptionable judges, who had the unenviable task of picking a winner from 10 amazing dance compositions. We would like to thank our Judges, The Lady Mayoress of Adelaide Genieveve Theseira-Haese, Monica Williams from AISSA and Simon Loffler from University of SA MOD for their generous support. And likewise, a big thank you to the Adelaide City Library, the students, teachers and their families for supporting this wonderful event. Building programs for NAO on the Virtual Robot within Choregraphe is a great way to experiment without access to a physical robot and is the main methodology used in the Everybody Dance NAO competition. But for this to work effectively you need to be able to hear the Music to get your dance moves in sync. This troubleshooting guide should help get it working if you are not hearing anything. Choose your song and ensure it is in the correct format. The Virtual Robot will only play .WAV and .OGG file types; .WAV is recommended however. If you only intend to use 30 seconds of a 3 minute song it is best to trim it down to only the section you require. This is to minimise the file size and your load times for your program. It is best to do this with Audacity or other music editing programs like Garage Band. When this is complete ensure to export your file as a .WAV and create a file name with NO SPACES. In Choregraphe create a Play Sound Box found in Audio/Sound/Play Sound. Connect this to your program and click the Spanner in its lower left corner. Then select the file selector next to file name and within the now open dialog click the plus (+) icon in the top right and select Import Files. Find your music file and select it. 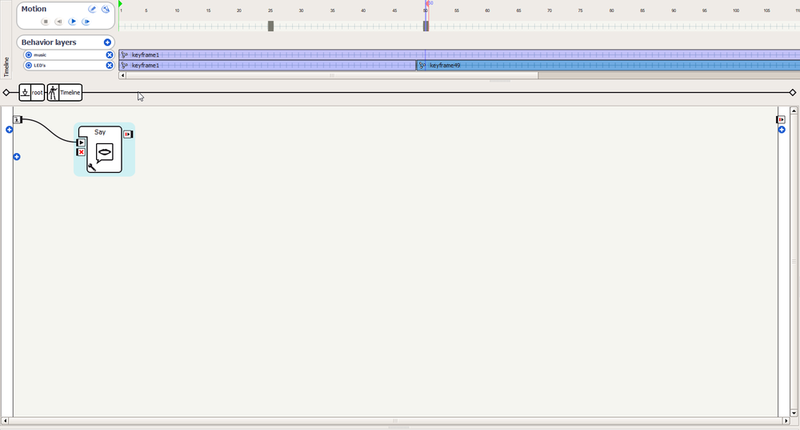 Once imported select your file from the Parameter Selection List and click OK.
Run your program and check for sound. Ensure your computers volume is turned up and that other computer sounds work. If it does not work please consult the list below for a solution. Ensure the file is a .WAV file the file name should be filename.wav, if it is not please convert to .wav using an online converter or music editing program. Ensure there are no spaces in the file name, you can shorten it or use a programming case convention like camelCase (new word is capitalised) or snake_case (underscores separate words). Congratulations to our Sydney ‘Everybody Dance NAO’ 2017 Finalists! The Sydney leg of the ‘Everybody Dance NAO!’ competition was held this year at The Connection in Rhodes stylish Event Space and was warmly hosted by the City of Canada Bay Libraries. Leading up to the grand ‘dance off’ our top ten teams had only an hour to perfect their coding with NAO under the mentorship of Brainary Interactive’s robot specialists, Jordan and Mark. The pressure was on to tweak any glitches and adjust those wayward algorithms, using an array of excellent problem-solving skills! And the results were awesome - each team created a unique dance for NAO, while working brilliantly together to ensure their program would be the best it could be. Now for the winners …. The BrainBots from Elementary Robotics Academy won in our primary school category with a superb dance programmed to music they had also composed. St Patrick's College for Girls Campbelltown won in our secondary school category with a sleek and sophisticated dance, which NAO pulled off without a hitch. Well done to all participants for making the day a huge success! We would also like to thank our partners at The Connection, Rhodes and the City of Canada Bay Libraries for their assistance on the day and for supporting this event, and a hearty thanks to all the students, teachers and families involved! Congratulations to the Humanoid Robot Project team for winning at this year’s Digital Disruptor Awards with NAO! The annual ACS Digital Disruptor Awards recognise the achievements and talent of individual ICT professionals and group ICT skills, and service transformations across a range of key award categories. Here at The Brainary we are proud to share in the success of the Humanoid Robot Project team in winning the Gold Disruptor for 2017 in the category for Service Transformation for the Digital Consumer (NGO/NFP). This research project has been a collaboration between The Association of Independent Schools of SA (AISSA), who own the NAO robots, Swinburne University, the University of Queensland and the Queensland University of Technology to gain insight into the impact of humanoid robots on student learning, the integration of the robots into the Australian Curriculum and the pedagogical approaches that enhance and extend student learning. The initial idea for the project emerged in 2014 when AISSA Educational Consultant, Monica Williams, met with Hugh Kingsley of The Brainary to discuss the educational applications of the NAO humanoid robot. From there The Brainary, which have the NAO franchise in Australia and were the catalyst for the project forming, connected Monica Williams at AISSA to Dr Therese Keane from Swinburne University and two of her colleagues, Dr Chris Chalmers from QUT and Marie Boden from UQ. One of the great outcomes of this cutting-edge research was learning how children learn in ways not previously known. Their preliminary findings also indicated an increase in student engagement, differentiation of student learning, self-directed learning, deep learning, and a fostering of creativity, collaboration, communication, critical thinking, coding and computational thinking. Congratulations to the researchers on a job well done! Researchers from left: Dr Marie Boden (UQ), Dr Therese Keane (SUT), Ms Monica Williams (AISSA) and Dr Christina Chalmers (QUT) shared the findings of the first year of the 2015-2017 Humanoid Robot Research Project at the Australian Council for Computers in Education Conference 2016. Melbourne's ‘Everybody Dance NAO' 2017 Winners - Congratulations on an awesome job! 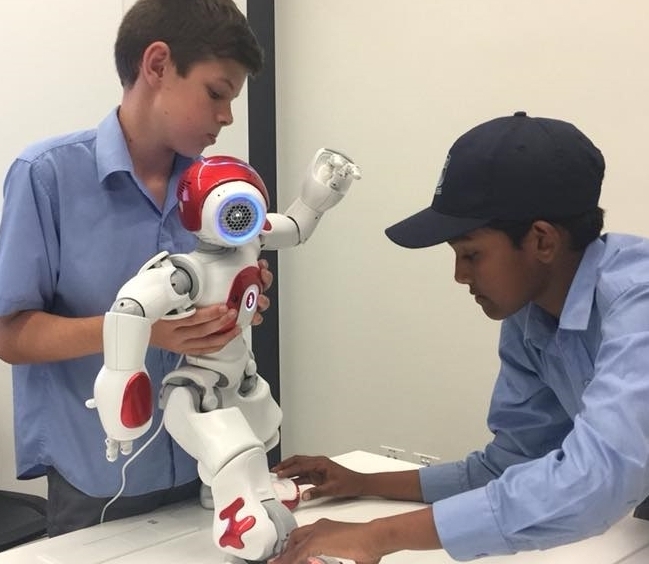 The Melbourne section of this year’s ‘Everybody Dance NAO’ robot dancing competition all started in August with 30 students signing up to participate in the NAO dance-off contest. This annual contest culminated in a grand robot-dancing finale at the Robotica Festival held at Science Works this weekend. All the entrants made a wonderful effort with Bialik College not only programming their NAO to dance but also writing the music NAO danced to. While Genazzano College did a fantastic mash-up of music medleys, ranging from rock to pop. And through it all NAO shone, performing in front the students, teachers, families and enthusiastic robot fans - all there to join in on the fun and excitement of the Robotica Festival. Established in 2015, ‘Everybody Dance NAO’ is a free programming competition designed to give students access to the latest robotics’ software and technology. Students and their teachers get to join the experts from The Brainary to learn coding, using the advanced humanoid robot NAO. We’d like to thank our partners DLTV (Digital Learning and Teaching Victoria) & Science Works for supporting this event. And a warm thanks to all the teachers and parents for their support, and especially for getting up early on a Sunday morning! When creating a timeline for Nao you can Add Behaviour Layers to your animation that you create. A Behaviour layer allows you to synchronise Box Based actions you find in the box library like speech, LED’s, sound etc to the actions in your timeline. If you have Synchronised music to your animation for a dance you have probably done this before, the following image shows a behaviour layer called music which at KeyFrame 1 (the start of the animation) The Play Sound Box will run. But we can add an extra layer to this and add extra KeyFrames which will synchronise the LED’s or some speech to the robots actions. To add an extra layer click the plus (+) sign on Behaviour Layers. You can then Rename this layer to whatever you like, but logical names are always best. We now have an extra layer we can use to synchronise other aspects of the robot. 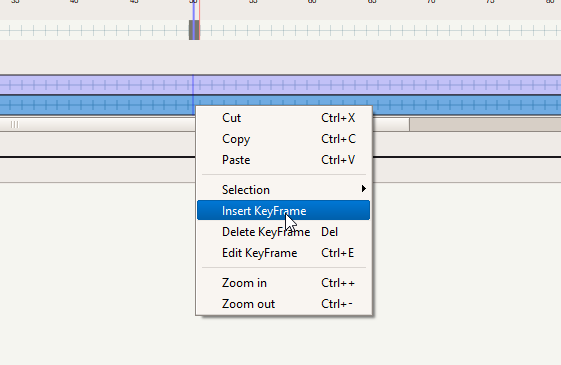 Right Click at the point in time you would like to have the event start and select “Insert KeyFrame”. This will create a KeyFrame. Using the workspace below you can add boxes to this KeyFrame. This Says at KeyFrame 49, run the Say Box. Adding these layers is an excellent way to add more to your animations. It is also an excellent way to make your programs Real Time. The 'Timeline' box within Chorégraphe provides an easy and intuitive way to create custom animations on your NAO robot. The video below was created for participants of our 'Everybody Dance NAO' programming competition and outlines how to program basic animations. For further information on 'Everybody Dance NAO' click here. Situated 910 kilometres South West of Brisbane (three-hours by plane) is the remote town of Cunnamulla. With a population of only 1,865, Cunnamulla is considered a low socio-economic area. However, the town boasts a diverse and passionate community, eager to develop skills relevant for the 21st century. Two years ago, this was made possible when the town's public library became the proud owner of a NAO Humanoid Robot after successfully applying for a Coding and Robotics Grant through State Library of Queensland. And they haven’t looked back! Part 1 - Adding trigger sentences. To add trigger sentences click the 'properties' button within the 'project content' window (see below). If you cannot find the project content window, select 'View' in the top menu bar and make sure the 'project content' is checked. Next you need to select 'Behavior_1' (this is the default name for applications unless changed) in the top left hand corner of the pop-up window. Now you will be able to add trigger sentence by clicking in the 'trigger sentences' box and adding each sentence in the top right hand bar (for example Macarena Dance). Now that you have assigned trigger sentences to your application, the application is ready to be installed on your robot. To do this, click the 'package & install' icon contained in the 'robot applications' window (see below). Now your application is ready to be launched via voice command. A. Package & Install - adds current application to your robot. B. Application list - Know which Applications are currently installed on the robot. C. Default flag - Indicates which behaviours are set as Default Behaviours. D. Execution status - Play/Stop installed Behaviour or Application. Bonus tip: Add a kill/exit switch to your application so that the application can be exited from the robot. A kill/exit switch is highly recommended for all applications loaded onto NAO and can be achieved using a variety of different sensors - some being more practical than others. In the image below the tactile head sensor is used for this function by connecting the box's input to the beginning of the application and its output to the end of the application. In this case, if the head sensor is triggered a signal is sent to end the application overriding all other boxes. 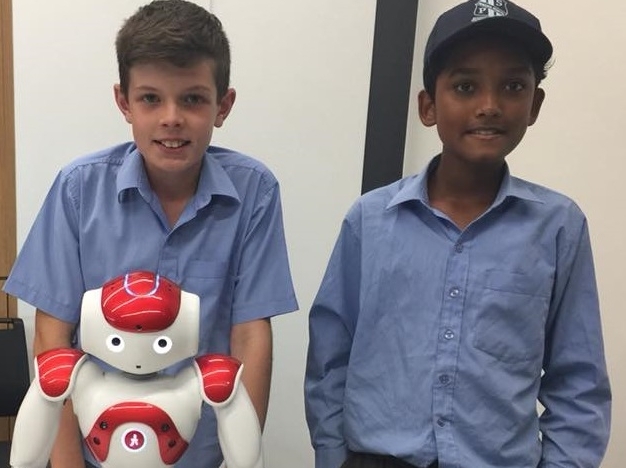 As an integral part of the National and State agenda, coding and robotics are quickly becoming mandatory within the Australian Digital Technologies Curriculum. Teaching technologies with NAO not only prepares students for future employment in the digital age but also provides an appreciation of how robotics can help in the community today. NAO is a unique platform both in functionality and design that inspires learners of all ages and abilities; from competent coders to those who have previously shown little or no interest in STE(A)M related areas. Mathematics – Use NAO to program coordinates or to walk along an X and Y axis to finish at a certain angle, or use NAO’s 25 degrees of freedom to animate the robot by placing its body parts at different angles. Nao can also process complex data and equations. Drama – Combine Drama, English Classics, and ICT to program NAO robots to perform Shakespeare’s plays as a school in the UK has done. 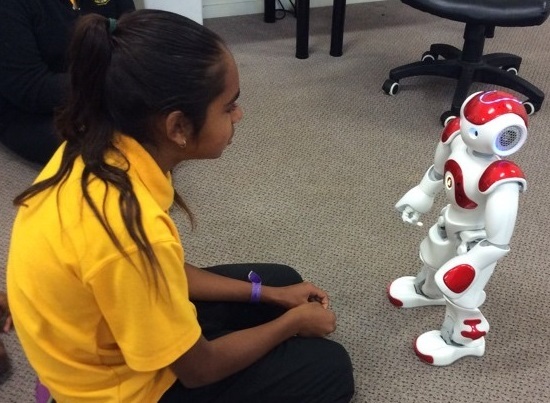 LOTE – Several Australian schools have used NAO in interactive language classes where students program conversations in LOTE, including an indigenous language. NAO currently speaks 19 different languages. Drag and Drop Programming and Python - The NAO Chorégraphe Software comes with an icon-based environment that eases students into algorithmic logic and programming principles. The interface also provides easy access to Python code and exercises in the accompanying STEM textbook offer multiple levels: beginner through to advanced. A Focus on Coding with a Humanoid Robot – NAO’s humanoid features allow students to create real life human-robot interactions. Rather than simply focusing on programming and coding, students program social interactions and learn about communication in an entirely new way. Virtual Robot – Chorégraphe provides a 3D virtual robot, enabling students to test their programs, troubleshoot, and refine their programs without needing access to the actual NAO robot hardware. This makes NAO a scalable and cost effective solution for multiple classes. Engagement - NAO is both an educational and motivational resource. NAO’s human characteristics of sight, speech, touch, hearing and movement connect to various student interests and captivate them on both intellectual and emotional levels. Students who see themselves as typically “person-oriented, non-STEM types” can become engaged initially through NAO’s likeable persona. Students can then start envisaging ways that NAO can be programmed to fill various roles in society and create their own projects that will ultimately require more complex coding. As such, NAO is a powerful tool to attract otherwise reluctant students into STE(A)M subjects and future careers. Competitions - Using NAO, STE(A)M education can come alive with the ability to run coding competitions that culminate in public events where NAO performs student programs. Digital Learning and Teaching Victoria host an annual dance contest called ‘Everybody Dance NAO!’ in conjunction with The Brainary. Community Engagement - NAO is a “professional level robot” used in numerous Australian Universities, commercial settings, and the health sector for rehabilitation. Programming with NAO demonstrates the impact of robotics in the wider community and allows students to create projects which directly influence their communities. By working with NAO students can critically engage with community issues and gain a richer understanding of diversity, such as how NAO assists people with autism, dementia and younger children. The Brainary’s package includes everything a school needs to engage students and teachers alike in STE(A)M, including expert teacher professional development, ongoing support, and a textbook with ten modules on how to program the NAO robot using Python Coding and Drag and Drop Programming. The textbook also comes with a DigiTech Curriculum Companion that matches exercises to the Australian Curriculum.